In Algoma Fall Adventure awaits! In Algoma Fall Adventure awaits. When one hears of visiting Sault Ste. Marie or the Algoma Region the first thing that pops into your mind is the Agawa Canyon Tour Train and in it’s own right it is a terrific trip. But there is so much more to do and see in the area for a wide variety of fitness levels. If you catch the fall colours at peak in Algoma, the many clichés that have been written about them are well, modestly understated. This after-all is an area that has been visited for more than 10,000 years as told by the ancient drawings on Agawa Rock, the First Nations peoples that came for the gift of the recourses the rivers lakes and forests, the Coureur des bois, the Hudson’s Bay Co, Famous American Author Stewart Edward White, Canadian Artist George Agnew Reid, and more well known is the Group of Seven who showed the world the raw beauty that is Algoma. What makes a visit to this area even more special is that no matter what your adventure level there is a way to experience what these spirits from the past viewed. From RV’ing or tenting in the Agawa Bay Campground of Lake Superior Prov. Park looking across the bay at sunset towards Agawa rock and the mouth of the Agawa river where they would have paddled or sailed into the safety of it’s natural harbour. Sun set looking towards Agawa Rock from the Agawa Bay Campground. Or you can do day trips up and down the Superior coast from the many motels and lodges. In the past few years this where I have seen the biggest change in the number of fall visitors, again not even close to being crowded, but after having many of these great vistas to yourself the change was noticeable, and it is great for the local economies! 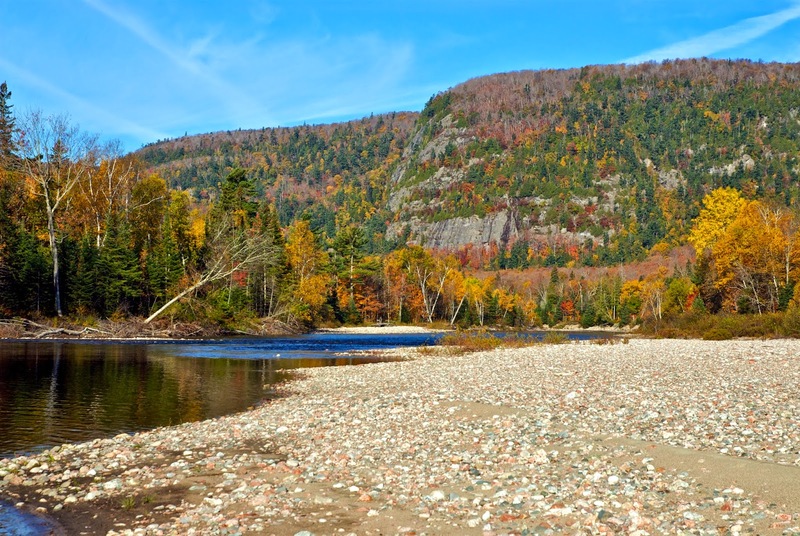 There is a wide variety of hiking from easy walks along the Agawa bay beach. Or for the extreme hiker some much more challenging hikes that the area has to offer. The Agawa Canyon tour train is by far the easiest way to see the area at a very relaxed pace. You will pass many Group of Seven painting locations that look very much as did 100 years ago. Visible view of AY Jackson's "First Snow" from the train. Most likely painted from the abandoned station 1 mile north of Frater. I must admit, what drew me to visit the area was not the Group of 7, it was the people who worked and lived in this rugged area. My Father worked in this area for the ACR after WWII. It is here that he learned his bush and canoeing skills from a First Nations member. Skills that I would inherit and use to represent Canada in International Canoeing competitions for 10 years and a lifelong leisure activity. But what I did find out that over the years as what was beautiful all those years ago is beautiful now. Be warned! Be prepared to step back in time for a much slower pace while riding the rails. I always look forward to the time when I board the train for my canoe or winter camping trip, it is a place and time that I can start to tune out the rest of the world and enjoy the beauty that is Algoma. The Group of Seven also inspired many other artists and photographers to come to this area, including George Agnew Reid. Different views, different lighting conditions, different seasons make for unforgettable landscapes. My preferred method of travel is taking the ACR passenger service in and paddle down to Lake Superior. On my trip in October 2012 I had an “Indiana Jones” moment where he is in the temple watching the sun line up the secrets. Site of Lawren Harris's "On the Agawa River, Algoma"
All of sudden the sun and the shadows started to line up to match the copy of his painting I had with me. It was incredibly exciting to watch and taking photos where he most likely painted. In his painting (and my photo) the shadow it very strong and the secret why that shadow was so strong would not be revealed until my winter camping trip. In the fall one must be prepared and respect the weather conditions that can occur during the fall seasons. After all this is Northern Ontario and as was with the ghosts of the past this area can be very unforgiving, even to the experienced. So whether you do day trips from the various motels and lodges in the area, local outfitters, RV in the campgrounds, site seeing from the air, or the ACR Passenger train and The Agawa Canyon tour train, an adventure awaits you in Algoma.